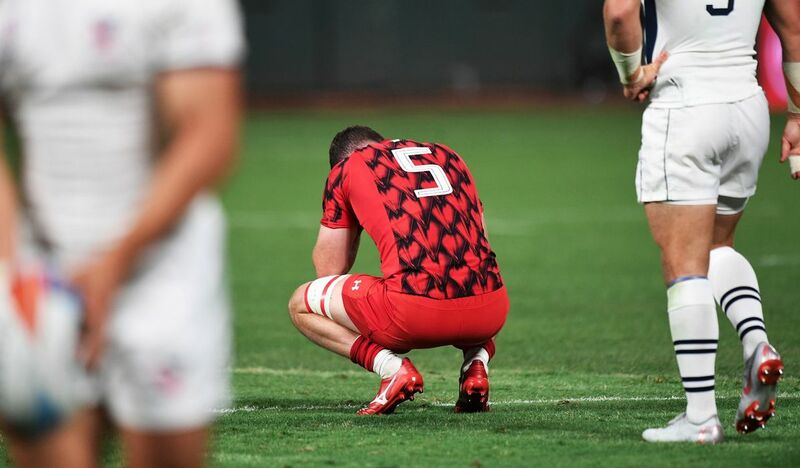 The brutal nature of knock-out rugby was evident to Wales on the first day of the Rugby World Cup Sevens in San Francisco. Needing to win their Pre-Round of 16 match against Zimbabwe to be in with a shot at the Melrose Cup, Wales showed admirable composure in absorbing two early scores before hitting back with five tries in quick succession. Jared Rosser was the first to go over, before a predictably electric brace from Luke Morgan was followed by efforts from Ben Roach and Cory Allen – the latter duo having a particularly strong impact from the bench. Luke Treharne and Ethan Davies were superb in converting four of them. Head coach Gareth Williams called it a “professional job” against the African outfit. He knew that emerging from that first encounter was always going to lead to a hugely challenging encounter against the hosts, one of the top six sides in the world. And so it proved, as the home crowd at the AT&T Park roared the Eagles on to a 35-0 win. “We started the game well against USA in a great atmosphere,” said Williams. “We implemented what we wanted to early on, but we couldn’t make the decisive break to score when we had them under pressure. Knock-out sevens it may be, but Wales have another shot at silverware – albeit not the Melrose Cup. They meet Samoa in the Challenge Quarter-Final at 23:10 BST. Live stream Rugby World Cup Sevens here.